The Heating, Ventilation & Air-Conditioning (HVAC) is installed by a crew of specialists over the course of single day. The furnace and air frame unit is installed in the attic of our two story home to take up less floor space than a garage, or in some cases, basement install. 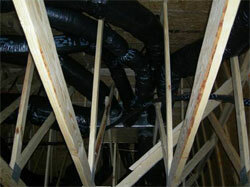 The Air ducts and return air ducts are run throughout the house from this central location. Small spaces that look like unused or “dead” space behind closets during the framing process are actually the channels that the ducting for the first floor will utilize. In addition to the Furnace, the compressor for the Air Conditioning is pre-wired on the outside of the house and all of the tubing is run from the air attic to that location. Though our attic was large, 12 feet from the floor to the ceiling, most of the space was taken up by the vast network of insulated pipes and junction boxes for our home. If you are in the process of building your new home, you should see to it that not only the aesthetic qualities of the house are looked into, but also all the hidden housing systems that you will incorporate in it as well. Obviously, you would have a hard time enjoying your home if you are too hot or too cold. This is why you must look into an HVAC system that you will have installed. Here are some guidelines that you may use to ensure that you will be making the best possible decision about this factor of building your new home. See to it that you keep the following considerations in mind as your contractors go about the planning the actual implementation of these steps. For you to be able to maintain the right level of comfort in your home, you have to see to it that your HVAC system will be able to balance the temperature and humidity that you will experience inside your living space. To ensure that you will be able to pick the right tools for your system, you need to get a clear idea of the usual humidity and temperature in your new home's location. Do the necessary amount of research that will educate you about these factors, especially in a long-term scale. See to it that you pick out the additions that you will use in your home's HVAC system depending on the needs presented by your findings. Observe the different areas of your new home and try to look out for possible problem areas as well. Walk into every single room in your home and try to find areas that may present air circulation and air containment problems. Before you have your final HVAC system installed, see to it that you take the necessary steps that will allow you to remedy these problems first. After all, there will be very little use to running your home system if the air that will be delivered to the different areas of your home is faulty. Ask for the help of a professional contractor in correcting these problems if you are not sure that you can fix them by yourself. See to it that you play an active role in choosing the different elements that will be used in putting together your home's HVAC system. After all, it is your home and you and your family are the ones who will be using the system for years. See to it that you choose the components that will not only perform their functions, but will also require minimum maintenance and upkeep. This way, you won't have to channel a certain portion of your regular home budget for this type of expense. There are a lot of options that are available in the market, all of which will be able to work effectively for your new home, so make sure that you choose only among the options that will not only fit your budget but your needs as well. Once you are sure that you have already checked into every single problem area in your home, and after you have picked out the best components for the HVAC system that you will install in your home, you may then go about the task of having the system installed in your home. See to it that you hire the best professionals for the job, to ensure that you won't have any problem even in the long run. Look for possible problem areas after the actual installation and have your contractor address them as soon as possible.